Honestly, I hate carnations with a fiery passion. I immediately think of cheap supermarket bouquets and I’ve been utterly convinced you’d have to be able to move mountains or do other miraculous works to make me think of them as anything but tacky…. … but lo and behold, Eddie Ross (of Bravo’s Top Design and Martha Stewart fame) has converted me. The DIY carnation centerpiece you see above was inspired by a piece he made for a industry show. 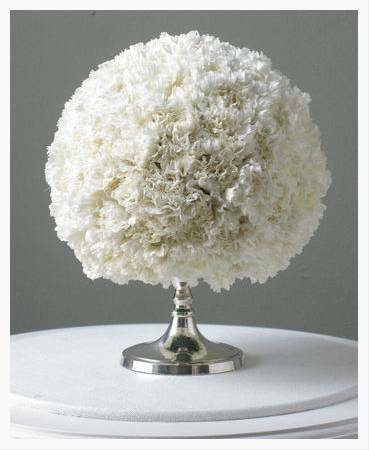 While the carnations-as-cake display he made wasn’t as mind-changing, I loved the look of the above centerpiece – and all it took was some stems, a soaked florist’s foam sphere, and an antique candlestick. I think these would be great for a bridal shower or if you’re looking for an inexpensive centerpiece for your wedding. Fiftyflowers has a wide varieties of colors to choose from if you’re looking to do it yourself. Visit the full post for the how to on Eddie’s blog. Aw…you’re so sweet. Thank you! Absolutely! My fiance and I were rooting for you on TD… we were totally bummed when you got cut! That centerpiece is gorgeous. I can’t believe it’s made of carnations!